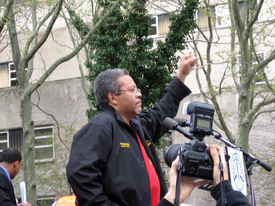 NEW YORK — Roger Toussaint, president of Transport Workers Union Local 100, was released from jail on the morning of April 28 after serving less than five days of a 10-day sentence for violating the anti-strike provisions of New York state’s Taylor Law. Toussaint’s jailing was accompanied by daily attacks on his character from certain segments of the media. But it also became a focus of mass solidarity. A march of thousands of workers across the Brooklyn Bridge protesting his jailing was followed by a round-the-clock vigil outside the jail. At the vigil, TWU members were joined by other unionists, leaders and activists in community groups, elected officials and members of the general public. Toussaint’s early release in the midst of this highly charged atmosphere led many observers to conclude the solidarity actions had an impact. Sentencing Judge Theodore T. Jones originally stated that Toussaint would not be eligible for early release. However, the growing vigil, the continued public focus and the obviously increasing prominence and prestige of Toussaint caused alarm in some sectors. An additional factor may have been that the route of NYC’s April 29 peace march would have brought hundreds of thousands of protesters past Toussaint’s jail cell. After his release, Toussaint marched with the lead contingent of the April 29 demonstration. Marching behind him was the largest labor antiwar contingent ever. An anti-Taylor-Law “sub-theme” was indicated by the double-sided signs carried by labor marchers, calling for peace on one side and for Taylor Law reform on the other. Meanwhile, despite transit workers’ recent overwhelming approval of the originally rejected contract, the Metropolitan Transit Authority remains intransigent. The agency is refusing to recognize the membership re-vote that approved the contact, saying that the original “no” vote rendered the contract null and void. On May 1, the union filed suit in Manhattan Supreme Court to compel the MTA to accept the result of the re-vote. The union cited several precedents for such action, and noted that when the Public Employees Relations Board rendered its decision providing for binding arbitration after the initial “no” vote, it explicitly said a re-vote on the original contract was possible and that the MTA still had legal obligations under the original agreement. Segments of the media are calling upon the MTA to accept the agreement, as are leading political figures, including Attorney General Eliot Spitzer and Speaker of the State Assembly Sheldon Silver. Even TWU adversary Mayor Michael Bloomberg has called for acceptance of the re-vote. The union is asking supporters to deluge the MTA with letters and phone calls demanding that it accept the TWU members’ contract vote. Looking beyond the contract, the union plans to kick off a campaign for Taylor Law reform with a day of rank-and-file lobbying at the State Capitol in Albany on May 16.